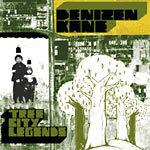 As a member of 'Typical Cats' and 'I Was Born With Two Tongues' (spoken word/poetry crew), Denizen Kane (korean emcee/poet extraordinaire) has finally released Tree City Legends. Typical Cats reunite on ''Calling Card.'' This album has enough Seoul for the masses!